Two professors known for their innovation in chemistry have been named fellows of the National Academy of Inventors. Daniel Armstrong is the UT Arlington Robert A. Welch Chair in Chemistry, and Richard Timmons is a Distinguished Professor of Chemistry and Biochemistry. They join eight other UTA faculty and administrators previously named fellows of the NAI, which recognizes life-enhancing inventions. Physics Professor Suresh Sharma received the 2014 Distinguished Service Award from the Texas Section of the American Physical Society. The award honors individuals who have made a significant contribution to the Texas physics community. UT Arlington has been named to the 2014 President’s Higher Education Community Service Honor Roll. The award is the federal government’s top recognition for community service in higher education. Between July 2012 and 2013, UT Arlington faculty, staff, and students contributed more than 680,000 hours of service. Chemistry Professor Purnendu “Sandy” Dasgupta has been named a fellow of the Institute of Electrical and Electronics Engineers. 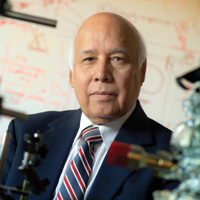 Dr. Dasgupta is recognized worldwide for his pioneering work in ion chromatography, the process of separating and detecting atoms and molecules bearing a net electrical charge.